I didn’t expect the ranking to be this way. # 1 was easy to pick. And so is # 2. I really had problems with # 3 and # 4. # 5 is a sure one. It’s a stylish and creative movie with strong performances that fall into ridicule. Most of the scenes involving its attempt to go into a psychological level goes campy because it’s overdirected and overstylish film. It’s a beautifully rendered Shakespearean romance. It captured the atmosphere of the period and the tragedy, the production design is impressive, and the lovers are believable. And yet, it have problems connecting to the viewers. It’s an isolating film where you may be lost. It’s an immature production. On one hand, it annoys me a lot that it forced me to ask if I’m watching just a stupid movie. On the other hand, it’s a movie with somewhat engaging characters, grandiose musical numbers, and a thrilling climax. However, the good parts outweighed the bad parts. It’s a one-woman show. It has several problems: the problematic pacing, the useless supporting characters, the dull second half. Considering all of these, I can’t hate it just because of the powerful tour-de-force by the ever talented Barbra Streisand. And several songs will just stick in your mind. It’s a superb film. Sure, it sometimes goes overboard, but it has sharp direction, impressive production design, and a great screenplay. And on top of those, we have the fiery battle of wits between Peter O’ Toole and Katharine Hepburn that is sure to be remembered. It’s really hard to rate the middle three, since it’s all about comparison. And I didn’t expect this year to be this…. weak. really willing to hear suggestions for the next year. It’s the only Best Picture winner with a G rating from MPAA. It’s the last musical to win Best Picture before 2002. It’s the movie that gave Carol Reed that Academy Award for Best Director. And this is one of the most hated winners. The movie is based on two sources: the first is the classic novel by Charles Dickens, and the other one is the stage play based on the novel. 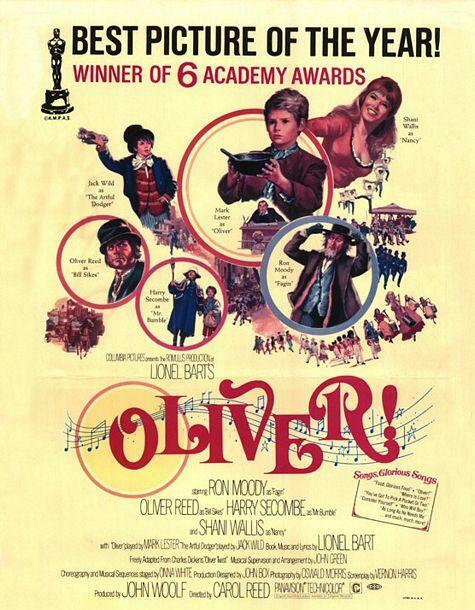 It is about an orphan named Oliver who was sold to a family but eventually escaped and ended up in London where he meets The Artful Dodger. Through him, he meets Fagin, the old leader of child pickpocketers. There, he learned how to do their stuff. But because of some twists, Oliver ended up with the rich man. Afraid that Oliver would expose the secret den of the thieves, they kidnapped him. There, a woman tries to save Oliver, but it is up to his will to survive that will save him. Basically, it’s a child’s film with very childish parts but also with violent parts. What am I talking about? Whatever. I used to really love it. But upon rewatching, my taste did change. First, the first thirty minutes and the parts with the children are so immature. I mean it’s like screaming, “Are you stupid, people?” But let me just explain this. The mood at the start before the first musical number is really good. When the children are now called to eat, the walking part is really good. But when the children started to do something else, ugh! The whole thing is so childish. I know, this is not some heavy movie that deals with abortion or whatsoever, but with this story of orphans, just have respect to the thing. Okay, I may get a little weird here. But I’m just saying that please, don’t make the viewers feel offended and stupid. Because it’s like the movie is just fooling us. And that line delivery – “Mooooore???? ?” It’s quite good, but it’s childish. Then we proceed to “Consider Yourself.” It’s quite a number, actually. It’s grand and it’s massive. And it’s cute. And here we have this quite long period of time where Oliver is gone, and actually, it’s a lot better. And after that, we have “Who Will Buy?” musical number that is, for now, my favorite scene in the whole movie. Here is the director’s best scene. It’s not corny, it’s not immature, and it’s just an Oscar scene. Then we have the tense part. And it’s really working. The direction is fine, but far from great. I bet Reed just won because he needs to have one. He’s been a long time snub, and they need to reward him. He’s fine here, but it;s uneven. The screenplay is much more of a mixed bag. On one hand, it’s living up to the spirit of the story. But on the other hand, it tends to forget that it has mature viewers, thus making it look stupid. The cinematography is really creative. Not necessarily one big innovation, but serves the whole movie very well, visually. The editing is okay. With its runtime and my complaints about it, it is still nicely edited. Some of the big musical numbers are really well-edited though. Sound is the 60’s norm, I guess. Costume design is great, but I don’t really expect much of grand costumes since they are situated in a poor status of life. Art direction is really good. It lives up to the London feel. And the whole thing is believable, and it doesn’t leave an impression that it’s only done in a studio. Make-up is pretty impressive. But there are no monsters here. So, no big prosthetics. Music is a mixed bag, but mostly great. Some musical numbers are cringe-worthy (“Where is Love?”, “Get To Pick A Pocket Or Two”, among others) and some are really impressive music pieces (“Consider Yourself”, “Who Will Buy?”, “It’s A Fine Life!”, “Ooom-pa-pah”, among others). But in the end, the good outweighs the bad. The acting is a rather mixed bag, too. We have a really good Ron Moody as Fagin. He adds layers in his character. He’s campaigned lead, but he was not really given any chance to have a three-dimensional character, but he utilizes it to make Fagin an understandable yet quite an unknown man to us. He leaves this layer of mystery, but there is humanity. Oliver Reed is a memorable villain here. He is a VILLAIN here. And yes, he lives up to his character. But for me, the most interesting performance comes from Shani Wallis who, I’m surprised, doesn’t even have a nomination. It’s an incredible piece of acting. She tries to be tough because her environment needs to be. And she loves a man who just happens to be a villain. With that, we don’t really get to know if he’s just blinding herself, of she is already used to that, or she stays because she gets money from him, or she just simply loves him. Sure, she says that she stays with him because he needs her. But is that really it? Or she is the one who needs him. It’s an incredibly layered and powerful performance. And her line delivery is sharp. In this group, we have the okay performer – Jack Wild – as The Artful Dodger. He doesn’t add nor harm anything in the movie. But I’m just surprised that he got nominated. Really? Unfortunately, the worst of the cast is the lead. Mark Lester is no effective actor. Tell me if I’m wrong, but he’s a miscast. He doesn’t fit in there. His acting either goes from too comfortable or too stiff for the role. And the singing voice! It’s not him, and the voice is no even a him, but a her. And it is really awkward to watch. In the end, the film also has problems with its message: is it really against poverty or is it promoting it? I mean, we have a character in the slums, in the underworld, but should not be there. It’s a horror for him. But he gets friends there. Anyway, it’s just a small observation. In the end, we have a movie that has both good and bad things in it. But the good things outweigh the bad things a bit that after watching, what you will remember are the good things. I think this might just be Katharine Hepburn’s best dramatic performance. The movie is about three princes of the kingdom who are fighting to get the throne of being the next king. All of them have the desire, but they must battle, not only with sword, but with wits, as they start to compete each other by being wise. Enter the king, Henry II, who is having a time of training his sons to become the possible king-to-be of the kingdom. He is having an affair with their assistant, who happens to be her mistress too. Enter his sensible but somewhat bitter wife, Eleanor of Aquitaine, who happens to be jailed. She comes back to the kingdom to celebrate Christmas with her family and to propose to Henry that her favorite son, Richard, should be the next king and not his favorite son, John. Even though she almost breaks down due to the fact that he doesn’t love her, she maintains her composure. In this family is all but troubles. And their kingdom is on trouble. Opponents keep on winning, and the kingdom doesn’t seem to be in order. Enter King Philip to make friendship with the king, but he plots for the downfall of the kingdom. All of these characters make the twists and turns and twists and turns of this very dynamic story. In the end, terror has been overwhelming the kingdom. It’s now up to the family to make the kingdom a whole. This is one hell of a movie! It’s an all-star movie. And I’m not talking of actors only. First all, the direction is so sharp and good. It knows when to calm down, it knows when to heighten the tension, it knows how to make it ironic and funny, it knows when to be serious – it’s full. I think it’s best scene of direction is the climax. Everyone’s running around, and we get to be in there. And that’s important. Most costume dramas tend to be atmospheric but not involving. It has both. And it’s not really because of the sets. But because of the direction. It knows how to move the characters, the story, and it’s consistent. It doesn’t just go haywire, even though the situations are. It’s just there, and it’s because the mood has been set. Eleanor: My Richard is the next king, not your John. Henry: Why do you care? Eleanor: I care because you care so much. What would you have me do? Give out? Give up? Give in? Henry: Give me a little peace. Eleanor: A little? Why so modest? How about eternal peace? Now there’s a thought. Henry: Believe me, I’ll strike you wherever I can. It’s a genius, believe me. Yes, some might say it’s unbelievable because it’s the Juno of 1960’s. Yes, sometimes, you can feel that the whole screenplay is a screenplay that has a quotation for each line. But it’s in the spirit of the story and character. The production design is all excellent. To make the whole thing somewhat silly but serious but elaborate but simple, and most of all, realistic, believable, captivating, it’s breathtaking. The editing is swift. It has the good ol’ choppy shots, but I’m quite fine with that. The cinematography is okay. It was sometimes dull, but those old-fashioned zooms in some specific scene are well conceived.The music is well-conceived, since it succeeds in giving the movie the atmosphere it needs – that royal tension feeling. The acting is pitch perfect. Peter O’ Toole is powerful as the king. He knows his character. He’s loud, but not irritating. And why? Because he understands that the character needs to be loud in such a way that it gives the voice of superiority. I don’t know if there is really such a thing as voice of superiority, but his voice is very characterized that you don’t feel that it’s out-of-place. His acting piece is when he demands the priest to be called in the middle of the night for a wedding. That is great! He’s hysterical there, so is the mood at that same scene, but he knows how to make its work. It’s an epic fail if he failed, but he’s in control of his character that you understand why does he do that. Katharine Hepburn. What could I say? Every praise it deserves has already been said. He is Eleanor. The tie that year for Best Actress is one of the best moves the Academy has ever done, since it rewarded actresses who became in their characters. I don’t know. She’s so in her character. Her character is not hysterical, but what her character is very technical. The character is calculated. And so is her characterization. Every action he gives for the character is well-decided, there’s no single false move in her acting here. As what I have said, all the praises have been sung to her already. She’s perfect for the role, and I’m one of her supporters here. Just read the comments of other reviewers since I can’t find any fault in this character. She’s flawless. An all-time best. And the best thing about it is that it was able to connect to the audience. In the intelligence it has, it’s just one step from isolation. And it’s just so good in establishing the connection. However, my not-that-big criticism here is that it goes somewhat overlong in many scenes. Some talky scenes just seem to go on and we just get lost. But I can’t dismiss those who love it. In the end, what we have here is film that is near perfect, almost flawless, and very-well executed film that doesn’t seem to get my full love, in spite of the love I have in this movie in pieces. This is one of the most beloved Shakespearean works ever. And, after I have watched it, I just saw a pure Shakespearean movie. I guess I don’t really need to give the story of it since it’s already known to all. But for the sake of some readers, I’ll just give a very brief preview of it. The movie is basically an adaptation of the timeless play of love by William Shakespeare, the tragic tale of the famous star-crossed lovers Romeo and Juliet and their dueling families, the Montagues and the Capulets. I admit – it captured an atmosphere I haven’t experienced before. Maybe it’s the fact that it really tried to stay as near as possible to its source material, thus giving the “authentic” feeling of being in the period. I am quite impressed on how it really gave a feeling that the whole thing is genuinely Shakespearean. It’s all lavish – the costumes are catchy, the production design is grand. In other words, the film is set on epic proportions. In many ways, I can sing a lots of praises for this film, mainly because it has a lot of good things in it. The music is wonderfully played throughout the film. In some parts, its emphasis on poetry and romance is so wonderfully interpreted into music that watching the film is like listening both to poetry and to music. The sound is quite impressive, if you’ll look at the production background of the film. The movie was shot with a camera that caused a lot of noise, so, as a remedy, the dialogues and others were all separately recorded and looped. And based on how clear it was, the sound is already noteworthy. The film editing was also precise, mainly because it needed to be concise and yet, you feel that it just constantly moves, and not dragging. And it somewhat does its job to bring a cohesive story. Some brilliant cuts, some tense fight scenes, and the film’s brilliant climax – that scene at the mortuary. It’s so tense and thrilling to watch because of the editing. The cinematography lives up to the film’s colorful setting. Some shots are just okay, and some are really interesting. 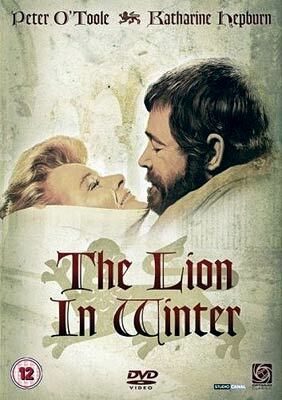 The shots at the beginning of the film, complimented with the beautiful narration, makes the whole atmosphere of the ill-fated romance right at the start of the film. and it’s a great sign. I’m not really expecting to see those dated but fun to see fast zooms, but I’m fine with that. Last words for this is the shots of both their bodies brought side by side, which were just haunting. The screenplay is genius. Adapting the play is common, but to make it brilliant is an another way. In a way, the film is a feast for the eyes. But it should be noted that this is a Shakespearean movie, and giving emphasis to the poetry is important because it’s the main reason that you made the film at the first place. And I can say that this adaptation is well-done, based on its screenplay. Just a bit of trivia: I was sort of laughing when Juliet enters to a room as her mother calls her since I instantly had a strange comparison of Hussey’s and Gwyneth Paltrow’s delivery of the lines. Also, the balcony scene is one perfect move from the screenplay and for the movie itself. This is a pivotal part, since this is, not only extremely famous, but the sign of the development of the romance. The acting is well-done all the way, though I’d only note the three actors who somewhat stood out. Of course, we have Olivia Hussey as Juliet. Juliet is a very delicate character, and just one false move, and she is ruined. The secret of the success of the role is care and appropriateness. Like what I said, Juliet is a very delicate character since she’s the innocent one here. Even Romeo is already aware of the realities of the dueling families, but Juliet is just having the idea of it, she’s not aware yet of the violence. And Hussey plays it so well. Leonard Whiting as Romeo is perfect. He simply feel real as Romeo. I had already forgotten Leonardo DiCaprio’s rendition of the character, since it’s very different, both in treatment and in style, but as far as my (humble) knowledge is concerned, Whiting is the one that I can really imagine as Romeo. Their balcony scene is a very romantic scene. I can feel the romantic ‘spark’ between the two when they have their line deliveries. I don’t know, but it simply goes down to history as one of the best romantic scenes of all-time. And their finale at the mortuary is just achingly perfect. I can’t stop bringing myself to tears with this scene because it’s so real. Aside from the two, I’d just like to mention Pat Heywood as the nurse. She kind of resembles Frances McDormand in a way. Anyway, she was an important emotional anchor for the film. She was just laughing in many parts, but she serves more than that. As a connection between the two, she may just be tagged as quirky, but I can sense that there is something under her big clothes and her laughs. A nomination should be given to her. So, there you go. I sang all the praises. And it’s pretty much many. But why I didn’t LOVE the film? Isolation. The movie is brilliant. But unfortunately, it never really tried to be accessible to the audience. Many movie lovers love this, but I’m sorry. I don’t. Yes, there are parts that you do get involved in the situations, but it just happened rarely. Most of the time, it’s lavish, but not connecting. The romance do work, and it’s just the few parts where we really get to understand how it is to be there. But as a movie of epic proportions, I am looking for the “in-there” feeling. Even in personal stories, I need that. But the film doesn’t place you in there. You are just stuck in front of a screen, watching this movie. Movies like this should be EXPERIENCED, but we’re just drawn by the visuals and the music, but you just can’t be there. And I can blame that to the director. He made a big production. And I’m quite impressed. However, he just didn’t do that much effort for the viewers to connect to the movie. The movie is beautifully rendered, it’s a classic and timeless romance, but it’s far from perfect. It’s lacking in connection. In 1968, Paul Newman was the star. But not because he’s the actor in his movie, but he’s the one directing it. And the star is his wife, Joanne Woodward, who almost everybody hails in here as her performance of a lifetime. Today, it’s totally forgotten by the masses. Only Oscar fans and Newman/Woodward fans give their time to watch this film. The movie is about Rachel Cameron, a schoolteacher in their quiet town. She doesn’t have a man. She has a quite noisy friend, also a co-teacher in the town school. And she leads a peaceful life, aside from some emotional detours in her daydreaming. And that’s her conflict – the daydreams are reflection of her past that continues to haunt her. At the same time, she hated the summer because she has the feeling that this summer is the last summer of her growth, and the following summers will just start to bring her down. Now, in one prayer meeting in a church where her friend worships, she attends and breaks down while shouting. After that, it was revealed to her that her friend has physical attraction to her. She stays away from her. At the same time, she meets her high school classmate and she falls for her first sexual experience with a man. Believing in a promising future with him, she already have plans of having a child. Until one time, she just thinks she have a baby inside of her. I guess that’s the best word to describe this movie. Why? Because it tries to be ahead of its time but it ended up being weirdly dated. It struggles to be “modern” but the modern that it tries to reach is already dated when it comes to us. First of all, the acting is quite good. But the praises is only suited to the two actresses here – Joanne Woodward as the title character, and Estelle Parsons as her friend. Parsons’ Blanche Lew is still reflected here with some noisy scenes. And maybe she was just too hysterical here. But it somewhat worked. Her work here is far from great, but it really feels that she knows her character. Sometimes, it’s annoying due to the fact that it tends to steal the spotlight from Woodward, but nevertheless, she plays a key plot point for this movie. A nomination could be deserved, but way far for a win. Now, Joanne Woodward is near-great as Rachel. She handles her somewhat problematically written character with such mastery that she doesn’t make her character step with the wrong foot. The character’s facade is tough, but in her eyes, there is the vulnerability and fragility that the character contains inside of her. Her best scenes have Oscar written in it: the breakdown in the church (so wonderfully acted, mounted with the haunting music and great direction in that scene) and her quiet moment of crying after she found out what’s really inside of her. Both of those scenes show that she has the capability to make her character human. The problem enters with the screenplay. It never tried to make the characters and the whole film engaging and accessible to the audience. Sure, it has a fairly interesting concept, and it managed to squeeze in the back story of Rachel in such a way that it blends in with the present storyline, but please! No matter how mysterious the story is, if you can’t make a connection between the characters and the viewers, then something is really wrong. Speaking of the back story, even though I said it blends with the present storyline, I had problems with it also. Some scenes doesn’t really call for her childhood memories to be seen by the viewers. In some parts, yes, it works, but if she is just walking, do we really need to see an unnecessary intercutting between the two? Also, the film led to nothing. It had events that will surely interest some, but it doesn’t build up anything. We just follow her. OK, I do like/love movies that doesn’t really follow the usual narrative flow, The Hurt Locker as a recent example, but the thing is – it has a point, it leads the audience to something, the movie involves us for us to care about it. And that’s where the film committed most of its mistakes. Also, those talking to self voice-overs just got irritating. I believe it’s unnecessary. Also, I had problems with the direction. No offense – this is a credible directorial debut from Newman. He knows how to direct a movie. But to direct a movie well is another thing. The whole thing is messed up, and he didn’t try to do something about it. And that’s such a sad thing because there are really bits of directorial brilliance here. The flashback scenes, though it was blended, turned to throw the movie off-balance. It’s just that it wasn’t consistent. Obviously, it tried to be something, and I can feel that, that’s why I’m quite sad that it failed. The technical part was okay, mostly dated, serviceable, nothing notable. In the end, what we have is a movie that tried to present a personal story in such a manner that it would be aesthetically good and emotionally moving. It didn’t give full satisfaction to both, but it’s, I guess, worth a try. This is Barbra Streisand’s debut film. This is where Barbra Streisand got her first and only Best Actress award. 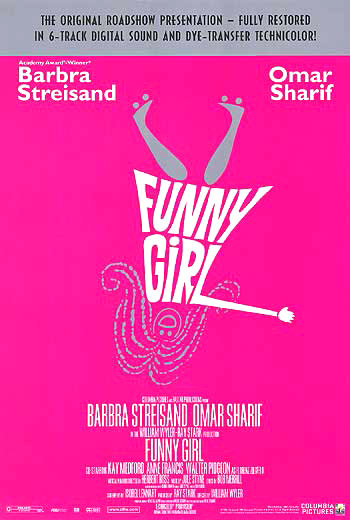 This is the movie that introduced Barbra Streisand to the whole world as a movie actress. This is the movie that featured one of Barbra Streisand’s signature songs – People. This is Barbra Streisand’s movie. But look, is this really a movie that can stand alone? The movie is about Fanny Brice, a childish grown-up who works in a vaudeville, causing a lot of troubles, and in the end, cheers. There, he meets the supposedly suave Mr. Arnstein. Then she goes crazy for him. Andhe disappears. And appears. Now, she is a successful Ziegfeld girl. Now, he convinces her to go with him in his life as a gambler. She leaves the spotlight and fame that she experiences in the Ziegfeld life and goes with him. Unfortunately, as everything is supposed to go into perfect happiness, he gets involved in some scam or whatsoever, getting himself into prison for eighteen months. She continues her life as a Ziegfeld girl. First of all, I believe it’s really a star vehicle. Some and I myself consider it a classic. But it’s really the classic star vehicle. You’ll understand me when you watch it. Basically, loving the film is impossible if you don’t love Streisand. She’s the soul and the ONLY living thing in it. She movies with grace throughout the film. And this is her film debut. And this is a gorgeous film debut! She registers her character from the start to the end with such newness that perfectly. Especially with her younger years, she plays it so well. And the fact that she can handle comedy, drama, and everything in between with such professionalism is the highlights of her performance. Some scenes however, end to be either overdramataic or no drama at all and you can feel she’s stuck by doing things to remedy the sufferings of the character from the film’s major flaws. Also, some scenes are plain. I know that she is a character of a very funny nature, but when it comes to drama, the limitations are still there. Still, I think it’s one of the most deserved Oscar wins due to the fact that she created such flawed and natural character with such ease. Unfortunately, this is a one-woman show. The rest are entirely forgettable. Omar Sharif is supposed to be charming and suave, but he’s so dull that I can feel that he’s not trying to do anything great. And that’s a big problem for me. Why is Fanny supposed to fall for a gorgeous guy, as she said, if what I’m seeing is a man of dullness? Sorry, wrong acting choice. Kay Medford got a nomination. Why? I mean a very big why???? Her role is very underwritten, she is so brief compared to her movie, and she never graces the screen with anything. I don’t know if her voice in this is real or not but it surely is distracting. Maybe her delivery of the line “Love him a little less, help him a little more” is quite good, mixing love and warning to Fanny, but other than that? Nothing. Purely forgettable. The other cast members are forgettable to the extreme. I think I could have lived even i just seeing Babs act it all. Maybe the other characters are just voices. Maybe I’m overstating, but the others are totally no use. Well, the technical parts are all done well. Cinematography is okay, sometimes remarkable, especially in the end. That final shot of her standing and the only light is from above, therefore making just the outline of her face and upper body is masterful. Editing was not that good. It’s quite lousy. Sound is okay. Costume design is grand, art direction is captivating, especially in the Ziegfeld scenes. And I don’t know if it was the make up or something else. But the whole movie, from the younger years to the adulthood are so well-made. Maybe it’s really because of Streisand’s capability, but I know make-up did something. The music is remarkable. Nothing to say more about that. The screenplay is a mixed bag. The screenplay is GREAT because it gave so much opportunities for Barbra to really shine in her movie. The screenplay is BAD because he just made it into Babs’ show. Again, this has an ensemble cast, but Barbra is the only one doing things for the film to work. Now, the direction is bigger bag of mixed things, mostly negative. It’s to be praised for all of what it has done in the first part. It was a very smooth flowing journey in the first part. But the second part really hurts. It’s so slow that I can’t blame Barbra worshippers to stay away from this film. It’s the part where Barbra is really needed to lighten the whole thing, but it simply dragged. In the second part, I can say that Barbra was not the star but the pacing. And I can feel that William Wyler never really wanted to end the story. He wants it to just go on and on and on. It might fascinate a few, but it’s frustrating. I know it is an old-fashioned musical biopic, but at least, give me a reasonable pacing! So even if the film itself is grand, it lacks in direction. The second part really hurts. The film is a one-woman show, it worked but not to the fullest. In know it could have been better, but the filmmakers chose not to. Would it be the biographical musical-drama? Or the epic drama-black comedy? Or the children’s musical drama? Or the small drama? Or the Shakespearean romance? I’ll start with a random nominee, then the last one would be the Best Picture Winner, Oliver!.